National Fatherhood Initiative (NFI) recently recognized New York City Mayor Michael Bloomberg with a Fatherhood Award™ in a ceremony at LaGuardia Community College. Mayor Bloomberg was honored for his leadership in launching two initiatives to strengthen fatherhood and families in the city: the Young Men’s Initiative and NYC Dads, New York’s first city-wide effort to engage fathers and help them to connect with their children. Mayor Bloomberg, a father of two daughters, has consistently demonstrated, through his administration’s policies and practices, a deep understanding of how father involvement not only helps children, but strengthens the entire city. Strong families make a strong New York. But too many children in this city are growing up without their fathers. We want more children in our City to experience the encouragement, support and love of their fathers. Mayor Bloomberg also understands the link between the challenges facing the black and Latino youth of the city and the problem of father absence. One of the key changes in practice that was identified upon the launch of the Young Men’s Initiative was to encourage family-serving agencies in the city to “identify where obstacles to father involvement can be reduced.” This approach coincides with research showing that young men without involved fathers face significantly greater risks of failing in school, using drugs, becoming involved in the criminal justice system, and facing a host of other challenges. Mayor Bloomberg’s innovative thinking and powerful leadership are making it possible for New York City to be an example for cities across the country on how to effectively serve whole families. Too often, dads have been left out of the equation, but Mayor Bloomberg is ensuring that the city’s agencies will serve them, which will lead to stronger families and a stronger New York. At a time when 32 percent of all New York City children under the age of 17 live in households without a father, and 54 percent of black and 43 percent of Latino children grow up in fatherless households, Mayor Bloomberg’s pioneering leadership on this issue is critical. 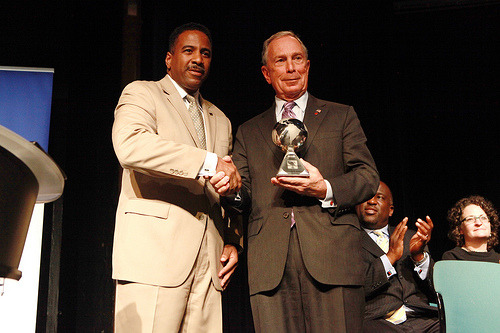 Warren presented the Fatherhood Award™ to Mayor Bloomberg at the first graduation for the CUNY Fatherhood Academy. As part of the Young Men’s Initiative’s effort to strengthen fathers and their families, the Mayor launched the CUNY Fatherhood Academy in collaboration with the Open Society Foundation’s Campaign for Black Male Achievement. The CUNY Fatherhood Academy is a free comprehensive program intended to promote responsible parenting and foster economic stability for unemployed and underemployed young fathers by preparing fathers to apply to earn a GED and enroll in, and graduate from college. As part of the city’s important work to become more father-friendly, NFI was recently contracted by the Department of Youth and Community Development to train and provide technical assistance on NFI's 24/7 Dad™ fatherhood curriculum, which equipped the department’s fatherhood grantees to address the most critical needs of the city’s low-income, non-custodial fathers. Inaugurated in 1997, NFI’s Fatherhood Award™ is presented each year to individuals, corporations, and organizations that make a substantial contribution to strengthening involved, responsible, and committed fatherhood. Among the recipients of the Fatherhood Award™ are: country music superstar Tim McGraw; former-NFL coach Tony Dungy; NBA superstar Dwyane Wade; newsman and author Tim Russert; and corporations such as Johnson & Johnson, Google, and Chevrolet. National Fatherhood Initiative works in every sector and at every level of society to engage fathers in the lives of their children. Connect with The Father Factor by RSS, Facebook and on Twitter @TheFatherFactor.